NightClub Dress for Genesis 3 Female for use in Daz Studio 4.8. I have included several Textures. Iray only I'm afraid. I have used some Allen Art textures. Wonderful Dress! Thank you, Wendy! Thank you for your time and effort on this dress and all your work!! Quite a change from your usual style and it's AWESOME! Thank you once again, Wendy! The horizontal folds give the dress more realistic when G3F is seated. Thank you ! Beautiful dress! Thank you very much. 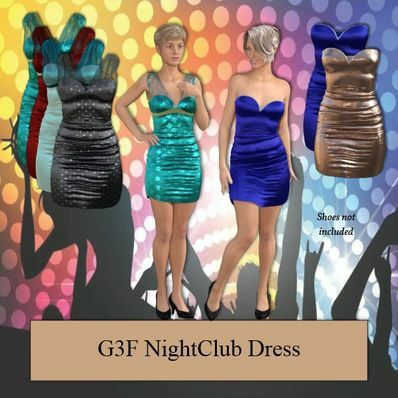 Thanks Wendy for creating & sharing these unique Night Club Dresses with Iray textures.